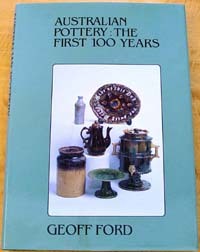 AUSTRALIAN POTTERY THE FIRST 100 YEARS. This definitive work of 416 pages contains 78 comprehensive chapters on pottery companies from all over Australia from European settlement to the closure of each pottery. It includes over 800 pottery pieces in colour, most identified by over 300 potter’s marks, together with over 100 original b&w photographs, showing the interior and exterior of many potteries, exhibition displays which include over 900 pottery pieces and portraits of the potters. Those who collect Australian pottery will find this an invaluable resource for identifying their pieces. The book also includes 66 pages of original catalogues and price lists, many illustrated, along with numerous old advertisements. The book contains a large glossary of terms, a compressive Bibliography and index. It is a landmark publication documenting the National Museum of Australian Pottery collection along with many pieces from private, state and national collections. IPSWICH POTTERIES 1873 - 1926. This book’s 56 pages contains 6 original historical photographs and 79 surviving pottery pieces in full colour. 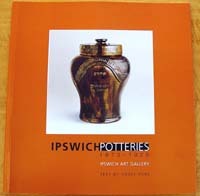 Published in 2004 to celebrate the 100 year of the City of Ipswich, it covers all the domestic potters of the Ipswich area from 1873 to 1926. 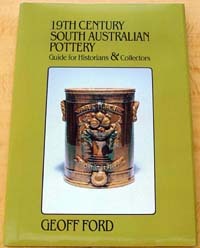 19th CENTURY SOUTH AUSTRALIAN POTTERY Guide for Historians & Collectors. This book’s 96 pages are devoted to South Australia's domestic potters. It includes 95 pottery pieces, 20 in colour, along with 23 potter's marks and over 25 original b&w historical photographs. It covers the period from European settlement in S.A. (1836) up to the closure of each pottery. WILLIAM HOLFORD’S ART & DESIGN INFLUENCE ON AUSTRALIAN POTTERY. This book’s 26 pages follows William Holford’s travels, exploits and influence on the pottery trade through 5 States of Australia from 1876 to the 1930’s. It contains 13 original historical b&w and 97 colour photographs of surviving pieces that have been identified to date. WATER FILTERS IN THE NATIONAL MUSEUM OF AUSTRALIAN POTTERY. This book’s 26 pages features a large true colour photograph of each of the 45 water filters in the Museum’s collection which were produced by 16 different potters covering the period from 1866 to 1930. Many potteries around Australia made water filters during this period that they sold to the public themselves, or for other firms such as ironmongers and filter sellers who sold them through their own stores or agents. Each filter is accompanied by detailed information about the filter and the ironmonger or filter seller for whom it was made, along with advertisements from the period, which makes interesting reading. $38.00 postage free within Australia. To obtain your copies of these authoritative reference books direct from the author Geoff Ford, we offer two payment methods. The second method is by Cheque or Money Order. To print out a manual form to post with your payment.